The CSA box for week 1 gave us tomatoes and cucumbers. My first thought: why not make a salad? But, what else should I add…? Not having tons of time to make complex dishes or tons of stuff from scratch every day, making a simple salad like this helps out by providing a good salad that can be a side for lunch or dinner. 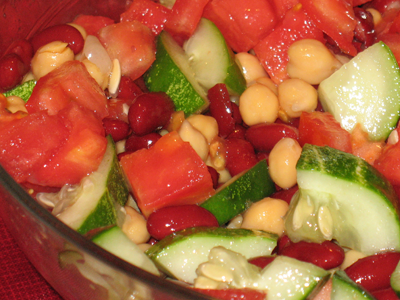 Adding some beans gives it color – and more fiber (yeay!) – and helps me ignore the fact that I’d really like to add some feta. Since DH has not yet climbed on the feta bandwagon, I figured beans were the safer addition. His verdict: tasty win! Stir to combine all ingredients in a medium-sized mixing bowl. Use either a few grinds of salt and pepper or a small amount, checking for taste as you go. This entry was posted in locavore, side dishes and tagged CSA, eat local, locavore, vegan, vegetables by crunchymetromom. Bookmark the permalink.